Once having learned how to draw jeans it is natural a “ how to draw denim tutorial” to follow. Here you will learn how to recreate denim fabric in your fashion illustrations using a very quick and easy technique. Step by step, as always! Including all the details, draw the garment you want to make look like it’s made of denim. Denim clothes are usually stiff and when you draw the folds make sure they don’t look too soft. Lay down the first layer of color. The final version of the jacket will get much darker, so pick a light blue for base. Tip: The technique described in this tutorial can be applied to every single color in the palette. It is absolutely not obligatory to use blue as base color for your denim drawing. Draw the shadows using a second layer of the same color or a slightly darker shade. Normally the clothes create shadows where there are creases or one surface is in front of another ( see the pocket). Also notice how the color of the collar changes in depth. The same happens with the sleeve. Start adding narrowed lines all over the fabric. Make sure that the lines look organized and follow the same direction. It is best to use a color pencil in a very similar shade to the base color. In the places where there are shadows repeat the process, but using black/dark grey color pencil. For the places you think are brighter use a white pencil. Tip: Color pencils are good to represent denim in fashion sketches, because they already have the crispy texture we are looking for. Try not to overwork your drawing with black and white lines. If you do so, erase the unnecessary ones. Take your white pencil again and this time make strong vertical bleached effects. They are supposed to hint where the jeans clothes are worn-out. Put those only where the volume of the body is the most bulged. Find an orange or brownish shade that will overlay the base color of the jeans and underline the stiches.This is very specific for jeans. Color the buttons and if you have any other details. You already have it done, but if the fabric looks too sharp for your taste I recommend you to take a paper blender and go over some parts of the sketch. This will give nice polished look of your fashion drawing. Have fun experimenting with denim fabrics in your designs! Your website is amazing! 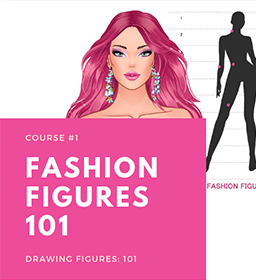 I’ve always been a huge fan of fashion, and hope to work in the business someday and this website really helped me in learning to draw. Is this done with pencil? Can you post how to draw Shorts and T-shirts? :D This website is absolutely amazing. Thank you so much! i LOVE your website!!!!! :lol: it the best i have come across in ages! your amazing! i have been into drawing fasion for all my life (you know as long as i can remember) i am 11 and a wanna be fasion designer. i love designing and also make alot of my own clothes. i all ways make my sisters dolls clothes as well. i am your BIGGEST FAN EVER!!!!!!! !